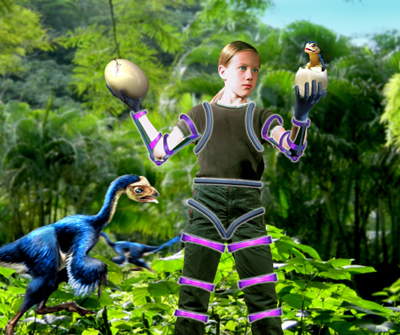 Students in the 2020s will explore knowledge in customized, full-immersive, 3-D learning environments, able to see, hear, smell, and touch simulated objects and interact with synthespians to foster a heightened sense of curiosity, says Diana Walczak, Artistic Director and Cofounder, Kleiser-Walczak. Published in 2020 Visions: Transforming Education and Training Through Advanced Technologies, U.S. Department of Commerce Sept. 17, 2002 and on KurzweilAI.net Sept. 17, 2002. Broad dynamic content will feed future education technologies. We will integrate motion and haptic interfaces, display and sound sciences, computer simulation breakthroughs, and next-level communication and information technologies. The vast possibilities created by these merging technologies make it crucial to bring together great minds from every discipline to begin building a foundation for the development of massive amounts of evolving content simultaneously and in collaboration with the design of next-generation education technology. The drawbacks listed above can be resolved by customizing the learning process, allowing students to experience more, and fostering a heightened level of curiosity. Students should pursue their own inspiration and learn at their own levels. It is a well-known fact that we learn more by doing. But how can we be individually exposed to many different ideas or places? By developing a system for students to experience more through increased usage of their senses. Students should be compelled more toward seeking creative solutions than merely following instructions. Let’s allow rivers of subjects to mingle in a confluence of endless possibilities and in the future, incorporate rather than separate the arts. How can technology help us overcome past educational problems, including those caused by technology itself? Though this paper highlights the individual full immersive education experience, a complete, stable, and discrete student learning structure includes teacher, parent/advisor, and group immersive experience nodes. All nodes are interconnected with mobile, home or class communication media. We will evolve into a more productive society through Adventure Learning. Picture an Adventure Learning structure in which the student is surrounded by four essential education nodes, each of which is connected to the others and to the student. 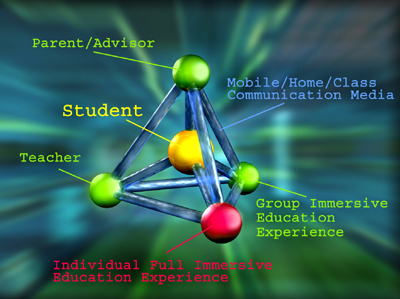 The four surrounding nodes are teacher, parent/advisor, group immersive education experience, and individual full immersive education experience. Mobile, home, or classroom communication media link the nodes to establish a unit of stable and discrete education. Communication media will become the glue that holds together a more customized and far less simplistic education system. The technologies that will vastly change information and communication are autostereoscopic display systems, 3-D sound, augmented reality, virtual reality, and portable or wearable ubiquitous information machines. Through any or all of these technologies, a teacher can guide or a student can present projects within the node or beyond. And all have access to “cybraries” and other information databases. The group immersive education experience can be an actual or virtual laboratory where students can work together to solve problems and achieve common goals. Telepresence with student avatars would allow students to work closely with other colleagues around the world or beyond. The group immersive experience could also be a variation of the individual immersive experience, placing the group in a larger display dome or providing retinal scanning or other virtual reality eyewear in combination with full-body force-feedback systems. This discussion will highlight the individual immersive experience portion of the overall system because of its tremendous potential impact on customization, experience and creativity. Iona enters the Tangitrek. With a force feedback exoskeleton, motion base, gimbaled harness and autostereoscopic display, a student can go anywhere and do anything. Fast-forward to the 2020′s. A 12-year-old student walks up a curving entry platform and enters a Tangitrek, which biometrically identifies her as Iona Sole. 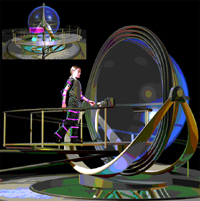 A 10-foot sphere envelops her after the entry platform rotates out of the way. Iona, who has two years of Adventure Learning experience, makes some selections. The system will accommodate and keep track of her preferences and skill levels in different areas. Like many students, Iona’s focus used to be more on getting good grades than learning. Now that she’s developed a strong desire to learn, she is already several years ahead of turn of the millennium educational standards for her age. As we continue to increase our knowledge through an accelerating number of virtual techniques, we rapidly lose touch with the tangible world. By further advancing our simulation capabilities we will actually bring real world challenges back into the virtual experience. The sphere Iona is now inside is the inner of a three-ring gimbal system that allows her complete freedom of rotation. The outer ring is attached to a three-degree-of-freedom motion base that enhances her sense of acceleration by moving up and down, side to side, and forward and back. Iona sits on a small seat and is gently enveloped by a body harness whose sensors make minute size adjustments and lock into place. The body harness is an intelligent force feedback exoskeleton. Twenty years ago this haptic, or touch technology was used for digital sculpting and surgical simulation. Now Iona can feel objects, step on surfaces, and fly through spaces. Like all students, Iona eagerly begins her adventure with her ongoing individual exploration project. From there she will traverse research branches which help to solve problems for her personal project or enlighten her to related subjects. Iona, an enthusiast of ancient mythology, has been studying the theoretical genetics of creating a winged horse. 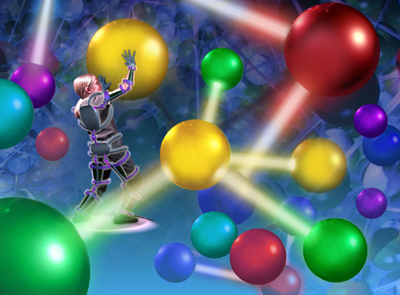 On her virtual mobile scaffold, Iona surfs through a giant chemical model whose surfaces and atomic bonds she can feel. In her visualization class, where students are coached in picturing imagery in their heads, Iona worked out a DNA protein configuration that her teacher was able to analyze from her brain scan. These days teachers expect a lot of the work to be done in the student’s head in an effort to exercise more of her brain and to avoid over-immersion. Iona begins where she left off by selecting and boarding a virtual mobile scaffold—not unlike a surfboard—on which she navigates through a giant model of DNA. She deftly arranges and rearranges the chemical model whose surfaces and atomic bonds she can actually feel. The photo-realistic autostereoscopic computer-generated imagery surrounding Iona appears to jump right off the inner surface of the plasma display sphere. Though the spherical display surface is never more than ten feet away from Iona, she perceives apparently distant images reaching to infinity. This adventure system has access to all the imagery and information in the entire US Public Cybrary; a student can access information without the commercial intrusions of general cyberspace. Iona closely observes a prehistoric youngster cracking its way out of the egg. She is able to see, hear, smell, and touch simulated objects and environments. When Iona reaches a juncture relating to bird origins which requires further research, she quickly traverses the Theropoda branches of Dinosaur classification and selects Caudipteryx > Hatchlings > Reality Simulation. Suddenly, Iona is standing in a Caudipteryx nesting grounds in an Early Cretaceous landscape. This world even smells different, as a function of the flora, fauna, and climate. The nanoaromatic system delivers and deletes aromas based on the biochemistry of objects in scenes. Aroma levels can be dialed up or down by the Tangitrek user. All around Iona, the small flightless theropods forage among the ferns. She picks up two eggs, feels their shape and weight, and vocalizes a few observation notes for future reference. Iona hears the slightest of cracking sounds that seem to come from exactly inside one of the eggs. A binaural 3-D acoustics system accurately positions simulated or recorded sounds with respect to objects that she sees in the spherical display system. Iona closely observes a prehistoric youngster cracking its way out of the egg. The industrial revolution, with its inventions and factories, by necessity bred a society in which following sequences of instructions was imperative. This approach has lingered through 20th century education even though we’ve been transitioning into a society where humans become more creative and machines perform manual or repetitive tasks. Adventure Learning allows students to navigate, investigate and determine their own solutions. Endless interdisciplinary combinations discovered in immersive environments will lead to new kinds of specialists with strong diverse backgrounds. Iona studies horse anatomy and works on a concept design for the mythical flying horse. Before allowing her to set out on a flying trek to ancient Greece, the system prompts her to solve problems involving English words with Greek origins. Reacting to Iona’s inadvertent avoidance of language, the system ensures a balanced set of disciplines is reached in each adventure. Iona flies over the Acropolis as it may have looked in ancient times. She can converse with synthetic townspeople about their era. 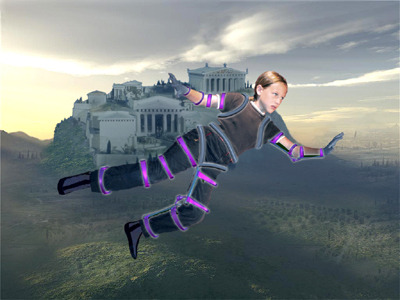 Flying over the Acropolis, Iona can see the structures as they originally looked. Simple hand gestures provide navigation as she observes Synthespians in ancient dress going about their business. She lands on the hill to browse the culture a bit. She makes herself visible and speaks with the simulated Greek townspeople. Recognizable highlighting allows her to see that there are a few other Tangitrek users in the area. In any cultural recreation, local Synthespians see Iona as one of them and are eager to discuss ideas relating to their era. Iona experiences the original language and can turn translation on as needed. She is directed to a temple full of sculptures of interest. She touches the sculptures to enhance her visual study of them. As she moves her hand over the neck of a marble Pegasus, the Tangitrek informs her to prepare to disembark. Though it’s difficult to leave the simulator, she smiles with satisfaction, knowing information from today’s adventure will be accessible from her personal media system. We know that with the development of content to drive a combination of technologies—haptic, autostereoscopic display, 3-D computer simulation, data management, harness and structural materials, personal media communication systems—we will be able to realize a profoundly valuable education system. The customized approach improves student self-esteem, intellectual development, and vocational planning. “Physical” experience increases retention, balances the psychological with the intellectual, and brings tangibility to ever-increasing virtual worlds. We will see a transformation in the workplace whereby a person’s focus shifts from the pursuit of a paycheck to a daily quest for knowledge and creative solutions when we finally develop education content and technology powerful enough to reawaken the natural curiosity of our students. © 2002 Diana Walczak. Computer-generated imagery created by Patrick Finley. Images composited by Io Kleiser and Diana Walczak. Text and images are intended for demonstration use only. Brosterman, Norman. Inventing Kindergarten. New York: Henry N. Abrams, Inc.,1997. Visitors to the Corkscrew Hill film ride at Busch Gardens in Williamsburg, Virginia are already experiencing a taste of what immersive 3-D virtual learning environments of the future might be like. Set in an Irish castle, the 4-D ride combines motion simulation with computer-animated, high-resolution digital 3-D stereographic images projected on giant screens and special theatrical effects to transport the audience into an imaginative Irish mythical tale. 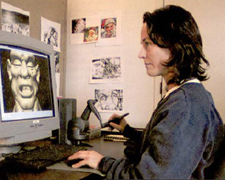 Diana Walczak, a classically trained sculptor and computer animation artist, pioneered the use of haptic technology in creating the 3-D characters, using FreeForm haptic (touch) software and the PHANTOM, a tactile force-feedback interface that simulates physical sculpting using virtual clay in the computer, both from SensAble Technologies. Walczak, co-director of computer-animation production house Kleiser-Walczak, also used this system to sculpt the characters in Santa Lights Up New York, a 3-D stereoscopic film for The Radio City Christmas Spectacular that takes the audience on a magical aerial ride around New York City. Other state-of-the-art 3-D Kleiser-Walczak projects include the Honey I shrunk the Audience attraction at Disney’s Epcot Center, Douglas Trumbull’s Luxor Trilogy at the Luxor Hotel in Las Vegas, the first computer graphics/live-action ride film, and the acclaimed The Amazing Adventures of Spider-Man attraction at Universal Studios’ Islands of Adventure in Orlando. Kleiser-Walczak is also noted for visual effects for the metamorph Mystique in X-Men (they’re working on X-Men 2, to be released in 2003), the stargate sequence in the Stargate film, and the face replacement effects in The One, along with animations for Honey, I blew Up The Kid, Mortal Kombat: Annihilation, Clear and Present Danger, The Rage: Carrie 2, and the first 3-D stunt doubles, in Judge Dredd. The company also collaborated with Ray Kurzweil on an interactive project that required the studio to create two virtual models for Kurzweil’s performance as his female alter ego, Ramona, at the TED11 Conference.